we'll be happy to take care of you. 100% NATUAL COTTON GUARANTEED - Most of other "cotton ropes" contain synthetic polyester or acrylic fibers. For REAL 100% Cotton Rope, choose XKDous. Our craft cord made from 100% pure, natural and high quality virgin cotton, no scraps or recycled fabric, biodegradable, odor-free and soft. It's an excellent basis for handmade projects and macrame supplies. NATURAL COLOR AND MULTI USE- The natural color makes this cotton twine string more attractive, easy to work with for artisan of all levels with beginners to advanced skills as it is easy on your eyes. Making beautiful fringe at the end when use it for macrame projects. 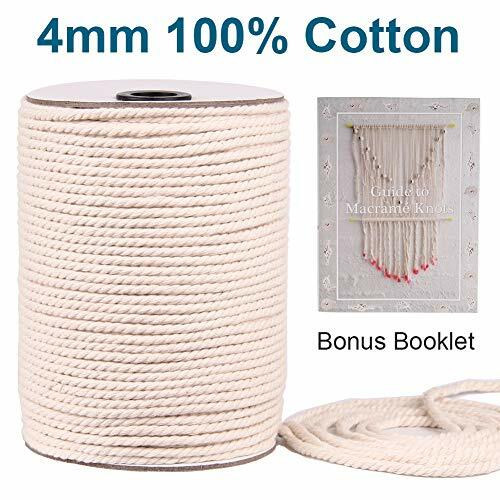 You can use this craft rope for dream catcher, gardening, gift wrapping, packing material, jewelry and craft projects, pets toys and more. SAFE FOR FOOD AND PETS, ECO-FRIENDLY - Untreated, unbleached, and undyed during manufacture makes this cotton thread harmless and eco-friendly. Safe for food, pets, and the environment. It's easy to dye by yourself, making this craft rope perfect for all kinds of colorful arts and crafts. FREE BOOK INCLUDED - You'll find our book is divided into two main sections. The first includes basic helpful hints and detailed illustrations and explanations showing how to tie various knots and knot patterns. In the second section, you'll find a DIY Macrame Wall Hanging project that shows you how to macramé step by step. View More In Macrame & Knotting. If you have any questions about this product by XKDous, contact us by completing and submitting the form below. If you are looking for a specif part number, please include it with your message.